Twenty years ago or more when little rectangles of plastic first appeared in our wallets and the credit and then debit card revolution began, I remember that it was considered uncourteous to use a card for a small purchase, indeed many retailers would only accept cards with transaction over say £5. I worked in retail pharmacy then and yes it was a pain, often literally, to have to put the card into the machine with a voucher which was then impressed with the card details and given to the customer to sign. Many times you got your fingers in the way and it hurt! Since then we have PIN numbers and now contactless payment, and you can even pay with a phone. We now think nothing of proffering a card for buying a coffee or a pint of milk. The statistics show that the point where the number of card transactions completed each year passed that for cash was reached several years ago. What does this mean now for the Church, indeed all other charities who rely on donations for their income. We live now in a largely cashless society and those who may be motivated to give when presented with an opportunity to do so, are finding that at most they have ‘shrapnel’ in their pockets or purses. Cash, particularly ad hoc donations are falling rapidly, not so much because people are meaner, poorer or less community responsible, but because they do not carry appropriate denominations of money with them. 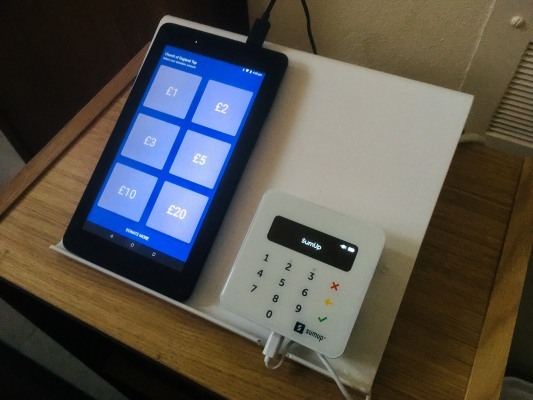 The digital world cannot now be ignored and the Church is now able to accept card donations as well as cash. The ‘offering plate’ is now more symbolic than practical so our stewardship demands that we offer a range of giving options. Firstly if you are a regular attender (that does not necessarily imply weekly attendance) or recognise the importance of the work of your local church to you and your community, you could decide to give a regular amount monthly through the Parish Giving Scheme (PGS), standing order or through the envelope scheme. This is best in many ways for the individual as it draws them into a greater engagement in the life of the Church and faith; and of course it improves the cash flow for the treasurer allowing proper financial planning. Secondly we have many who come infrequently, perhaps for family life events such as baptism, for festivals or who use the facilities of the church for activities that in our case vary from weight watchers, Parents and toddlers to Brownies. If in this diverse category then giving through the cash, cheques (they still exist) or card is now possible. We can also of course accept card payment for the hire of the hall or wedding fees. Holy Epiphany now has a card reader attached to an electronic tablet. It is simple and secure to use. The tablet displays a number of icons for different amounts, beginning at £1. All you need to do is press the appropriate icon and the card machine will invite you to use your card. You can do so contactless or with your pin, and if you wish a receipt can be sent by email or text if you wish and you enter email or mobile number. Simples. The process is secure, operated by encrypted WiFi and NO details of card or giver are seen or kept by the Church. Our treasurer only sees a report each month that lists the amounts transacted. We still accept real money of course and are delighted for every gift received, large or not so large; each makes a valuable and essential contribution to not just the building but importantly all the mission and community activities that happen at Holy Epiphany.